Certified Peer Support Specialists (CPSSs) are volunteers in recovery from substance use disorders. Our life experiences and recovery allow us to provide recovery support in such way that others can benefit from our experiences. Faces and Voices of Recovery (FAVOR) Pee Dee believes that peers provide a powerful message of hope for people who are hopeless. A CPSS also stands with the individual through their journey through recovery. Certification training is offered twice yearly in Columbia. Those interested must have a minimum of 2 years of uninterrupted recovery and must submit two written references, a 150-word letter about why they want this training and a completed application. FAVOR Pee Dee pays all expenses including the mileage traveled to and from the training. Forty hours of training is currently delivered Monday through Friday with a certification test the following Monday. Becoming certified can open a new career and volunteering for FAVOR Pee Dee offers the new CPSS the opportunity to gain experience useful when searching for a job. 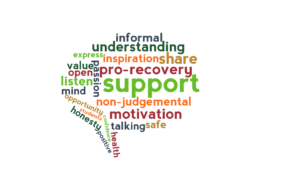 Our CPSS’ serve as Recovery Coaches and do Telephone Recovery Support (TRS). These services include assisting peers in mentoring them, identifying their goals for recovery, learning and practicing new skills, monitoring their progress and sharing their own experience, strength and hope based on each CPSS’ own recovery. Classes and dates will be posted on our calendar of events as “CPSS Cohort Training” You may also find out more about the class or when the next one will be held by emailing info@FAVORPeeDee.org.